Most of the great radio stations of the sixties used jingles from PAMS of Dallas to add that special sparkle to their presentations. KQV was no exception. 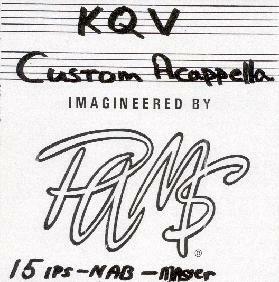 From Series 18 to Series 43, KQV used some of the best PAMS Jingles ever recorded. COLORFUL KQV was 'The Most Modern Sound'. 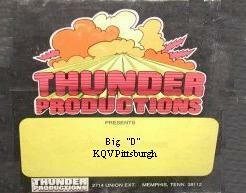 FUN-LOVIN' KQV was 'One OfThe Good Things About Pittsburgh'. AUDIO 14 was 'The Sound Of Pittsburgh'. In the Steel City, Pittsburgh listened to RADIO A-GO-GO to hear the 'Fun-Lovin' Five'. The BIG 14 was the place to hear 'The Happenin' Hit Parade', 'The Finest Forty', and 'The Wax To Watch'. 14 KQV was 'Where The Good Times Rolled'. GROOVY QV was 'The Pulse Of Pittsburgh'. Some of KQV's unique sound was also achieved by the ANITA KERR Singers who 'Turned Your Radio On'. INTERMOUNTAIN provided some of 'Fabulous KQV's' early jingles, as did CRC who made KQV 'Radiant Radio', and ULLMAN all part of the sound of "Wonderful KQV'. KQV program director Mel Hall had jingles produced by Intercontinental Broadcast Media in 1961. Click here for a list of KQV Jingle Packages on jingles page 2 ! Click here for my Want-List of KQV Jingles on jingles page 2 ! Jingles on this page are MP3.files ! The On-Line KQV DJ Jingle Montage. Nearly 23 minutes of DJ Jingles. From the beginning with Chuck Dougherty to the very end with Jim Carnegie. This is just a sample of the many jingles used on KQV. If you have a favorite KQV jingle you would like added to the website, please let me know. Thanks to Norman Barrington for the KQV Jingles below from TM Productions from a small package called "Keyed Brass". They are from the late 60's. They never hit the airwaves, but were part of a jingle demo. Now you can hear them here ! There are 4 Players below. Each player has 20 jingles in each. Reload the page if all 4 do not load properly. I hope you enjoy these classic Jingles! If you have a favorite KQV Jingle you'd like to find here, email me and I'll try to add it. KQV used portions of many of the above packages. I have copies of all of the above. - I'm trying to complete my collection of KQV Jingles. There are a only a couple of jingles that I am still unable to locate. The KQV Music Power ID's and jock cuts from 1971 have still not been found. Play these samples and let me know which package these are from. Special Thanks to Mike McCormick for providing more jingles ! If you have access to any of these missing KQV Jingle packages, let me know. The Old Jingles Pages are avaiable here.